Wetlands are known to be important sources of dissolved organic matter (DOM) to rivers and coastal environments. However, the environmental dynamics of DOM within wetlands have not been well documented on large spatial scales. To better assess DOM dynamics within large wetlands, we determined high resolution spatial distributions of dissolved organic carbon (DOC) concentrations and DOM quality by excitation–emission matrix spectroscopy combined with parallel factor analysis (EEM–PARAFAC) in a subtropical freshwater wetland, the Everglades, Florida, USA. DOC concentrations decreased from north to south along the general water flow path and were linearly correlated with chloride concentration, a tracer of water derived from the Everglades Agricultural Area (EAA), suggesting that agricultural activities are directly or indirectly a major source of DOM in the Everglades. The optical properties of DOM, however, also changed successively along the water flow path from high molecular weight, peat-soil and highly oxidized agricultural soil-derived DOM to the north, to lower molecular weight, biologically produced DOM to the south. These results suggest that even though DOC concentration seems to be distributed conservatively, DOM sources and diagenetic processing can be dynamic throughout wetland landscapes. As such, EEM–PARAFAC clearly revealed that humic-enriched DOM from the EAA is gradually replaced by microbial- and plant-derived DOM along the general water flow path, while additional humic-like contributions are added from marsh soils. Results presented here indicate that both hydrology and primary productivity are important drivers controlling DOM dynamics in large wetlands. The biogeochemical processes controlling the DOM composition are complex and merit further investigation. 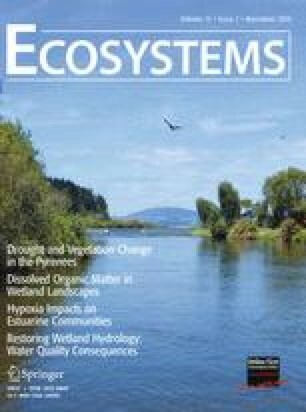 The authors thank EPA Region 4 and the R-EMAP Project, especially D. J. Scheidt and P. I. Kalla, for kindly providing the surface water samples used in this study, and two anonymous reviewers and the Associate Editor for helpful comments that improved the quality of this manuscript. NSF through the FCE-LTER program provided partial financial support for this research. YY and NM thank the College of Arts and Sciences for financial support during this study. This is contribution number 487 from the Southeast Environmental Research Center. Larsen LG, Aiken GR, Harvey JW, Noe GB, Crimaldi JP. 2010. Using fluorescence spectroscopy to trace seasonal DOM dynamics, distribution effects, and hydrologic transport in the Florida Everglades. J Geophys Res 115:G03001. doi: 10,1029/2009JG001140. Richardson CJ. 2009. The Everglades: North America’s subtropical wetland. Wetlands Ecol Manage. doi: 10.1007/sl1273-009-9156-4. Spencer RGM, Hernes PJ, Ruf R, Baker A, Dyda RY, Stubbins A, Six J. 2010. Temporal controls on dissolved organic matter and lignin biogeochemistry in a pristine tropical river, Democratic Republic of Congo. J Geophys Res 115:G03013. doi: 10.1029/2009JG001180,2010.